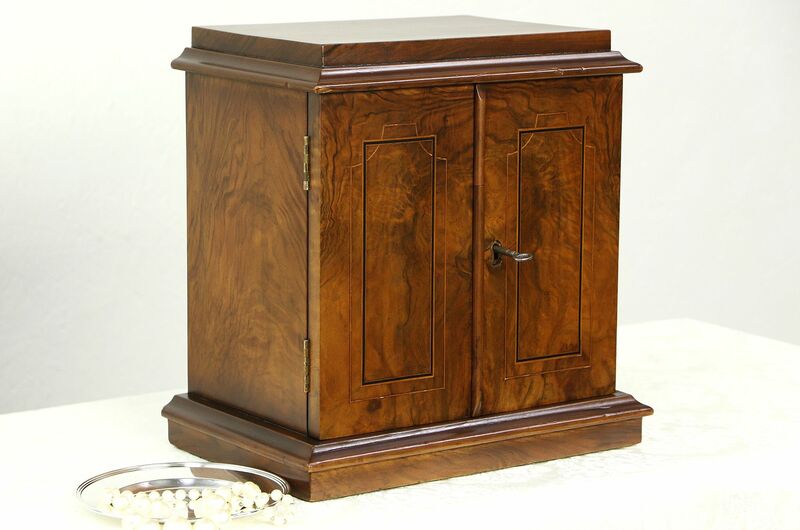 A sweet little jewelry chest or collector's cabinet was hand crafted about 1890 in England. Richly figured walnut burl has an excellent renewed finish. Doors have delicate inlaid ebony and satinwood banding. Drawers have solid mahogany sides with hand cut dovetail joints. Recessed brass pulls and the working lock are original on this miniature antique furniture. Size is 13" wide, 8" deep and 13" tall. USPS Shipping is $35 in the US.